The High Rise / Commercial window cleaning Service Provided through Great Lakes Window Cleaning, Inc. of Lansing Michigan. Michigan High Rise service area. We’ve been servicing Michigan’s premiere commercial Office Buildings, Hospitals, and High-Rises since 1980.. We have the experience, equipment and training to safely provide HIgh-Rise Window Cleaning service for any of your facilities. 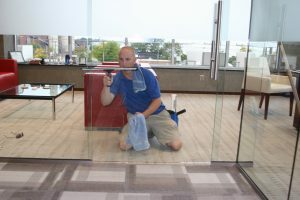 On average our commercial crews have over 10 years window cleaning experience, and are clean-cut, drug free and accustomed to working in professional office environments. We work hard day to day to stay on top of current OSHA regulations and industry safety standards. So if it can be done safely and creatively we are on it. We network with leading commercial window cleaning companies all over the United States to find the most safe and cost effective solutions to all of your facility’s window cleaning requirements. The sky is the limit. Our primary service areas for large commercial and hi-rise window cleaning services include most of Mid, Central and Eastern Michigan. 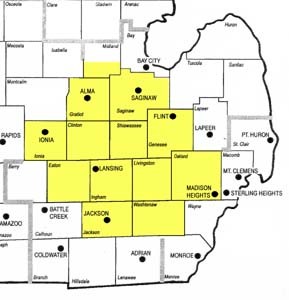 Estimates & Evaluations are free in our main service area which includes the Greater Lansing, East Lansing, Okemos, Battle Creek, Brighton, Flint, Ann Arbor, and Jackson areas, of Michigan. We are available in other areas for service, consultations or evaluation by request. However; outside of our main service area travel, service & other costs may be incurred. Please call to discuss. Michigan High-Rise Window Cleaning, Inc.